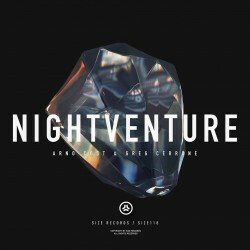 Arno Cost & Greg Cerrone – "Nightventure"
Slipping one last big track in before 2013 closes on us, Arno Cost and Greg Cerrone team up to give us "Nightventure". Cerrone got his start many years ago, having the genes for dance music (his father was a disco aritst) and a drive that brought him from a curious observer to a label head and producer. Likewise, the French-born Cost also grew up in a musical household, getting into the scene just before the turn of the millennium. Today's collaboration on Size Records proves that the veteran producers can keep things current, as "Nightventure" could make its way into any festival set. Big builds and driving progressions pervade the track, culminating in bright, crowd-pleasing drops. Keep an ear out for Cost's special Christmas mix, due out any day. Amazing. I've been dying to know what this is! Heard it a lot recently in Axwell's sets!